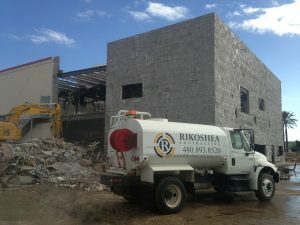 Rikoshea Contracting, Inc. is a 20-year family owned business crediting much of our success to our customers, trade partners and especially our dedicated, knowledgeable, and experienced staff. Todd has been operating Rikoshea Contracting for 20 years with a total of 33 years of experience in the construction industry consisting of field, project and operations management. He has a history of concurrently directing multiple projects successfully through effective management and team collaboration. Kathie has 25 years of construction experience consisting of preconstruction and project coordination, and office management. She leads the finance department and controls business operations including financial statements, accounting, payroll, accounts payable, accounts receivable, tax compliance, licensing, audits and insurance compliance. Michelle has 23 years of construction administration and human resource knowledge. She is responsible for the day-to-day management of HR operations and maintains functions such as employee compensation, recruitment, personnel policies and regulatory compliance. She acts as the liaison between our employees and our management team. She is also OSHA 30 certified and helps maintain our safety program. Trevor is a third-generation estimator/project manager native to Arizona bringing 15 years of experience to the table. He oversees the Estimating Department and works closely with Project Management to successfully find cost-effective solutions to common and complex construction challenges. Trevor is a hands-on manager and actively bids projects alongside his team. As a Valley of the Sun native, Keith has over 30 years of construction field, estimating and project management experience in both commercial and residential industries along with heavy civil earthwork. Keith is field performance and cost attentive, and with his background, this allows him to view potential and current projects with a unique point of view. Many of Keith’s clients confidentially utilize his estimates as the center point for our scope of work. Native to Arizona, John has over 16 years of construction estimating/management experience in the commercial, heavy civil, and residential industry. John is detail oriented, performance/cost minded, and has an eye for value engineering. Great at building, cultivating, and maintaining relationships with clients, customers and vendors. John works closely with our project management team to ensure that the project crosses the finish line 100% complete. Paul has over 14 years of experience in commercial & heavy civil earthwork take-offs. He is well versed with all software and programs related to take-offs. Paul has provided training and supervision to many individuals in this field. Paul provides accurate and detailed oriented take-offs for our estimating team to insure that we provide the best estimate for our clients. Sam has 23 years of experience in all aspects of civil construction in the field and project management. He is a results-oriented, hands-on professional well-versed in contract negotiations, resource allocations and project scheduling. Sam has delivered countless projects through coordinating trades, developing partnerships and building positive relationships with trade partners and vendors while maintaining costs.